My Book’s Back Cover Copy: Thoughts? 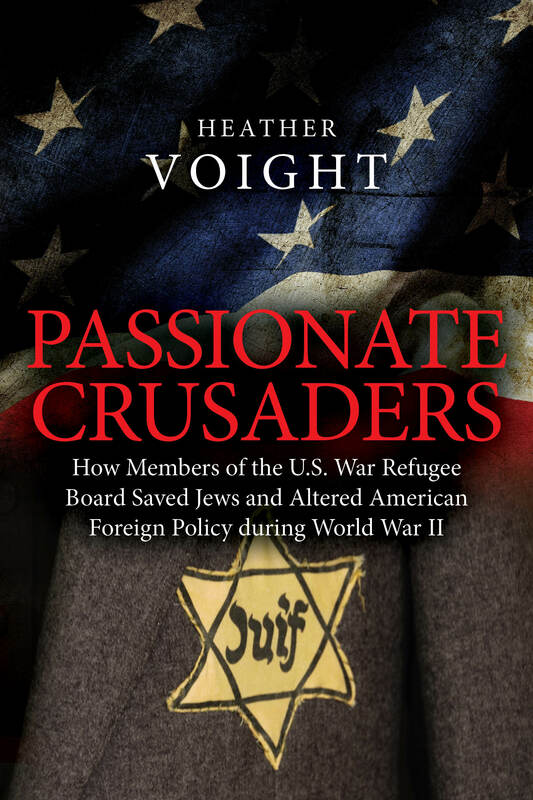 I’m looking for my readers’ opinions on my back cover copy for Passionate Crusaders: How Members of the U.S. War Refugee Board Saved Jews and Altered American Foreign Policy During World War II. Comments welcome! Scholars have criticized the Board for its inability to save more Jews and maintained that the agency should have been created sooner. Heather Voight’s research shows that despite its shortcomings, the War Refugee Board changed history and forever altered American foreign policy. Its creation ended the cycle of indifference that the government and the American public had shown to victims of the Holocaust. In the words of Henry Morgenthau, from 1944-1945 “crusaders, passionately persuaded of the need for speed and action” risked their reputations and sometimes their lives to save Jews. In addition to saving more than 100,000 lives, Board members also made a lasting impact on international law. They pressured the War Crimes Commission to broaden its definition of war crimes by including the murder of civilians by their own countrymen. This definition of war crimes was applied to genocides committed many decades later in Bosnia and Rwanda, and continues to be used today. “[Passionate Crusaders] shows that the efforts of an honorable and courageous few can create small steps to change history. This detailed, well-told, and inspiring story will be of value to students of the Holocaust, American history, and human rights.” –From the Foreword by Dr. Leon Stein, Professor Emeritus of History and Education Director Emeritus, Illinois Holocaust Museum and Education Center. Heather Voight is a successful freelance writer and history blogger. Since 2009, she has published articles on a variety of topics including the Gibson Girl, healthcare, and the writings of C.S. Lewis. She has a B.A. in History and English. As those of you who read this blog regularly know, I am in the process of self-publishing my book, Passionate Crusaders: How the U.S. War Refugee Board Saved Jews and Altered American Foreign Policy during World War II. After reading some great books on self-publishing, I knew I needed a professional editor. It took a lot of work for me to find the editor that was right for my book. Hopefully this post will make the process of finding one easier for others. Step One: Contact other self-published authors you admire and ask them for recommendations. I’ve found that many self-published authors are happy to share the names of editors with whom they or someone they know has worked. Sometimes an author will include the name of an editor in the acknowledgements of his or her book, so that’s another way to build your list. Step Two: Realize that you are not finished after step one. Please don’t assume that you have the perfect editor for your book once you have a few names. You need to get to know your potential editors first by moving to step three. Step Three: Visit the editor’s website to see how seriously this person views editing as a career. If the spelling/grammar on the site is poor, you know it’s time to move on. (I’m not kidding—I’ve seen editor websites that had multiple spelling and grammar errors). Also, see what other services this person offers. Does he/she offer primarily editing and proofreading services, or is editing tacked on to a long list of other things? Most of the time, people who tell you that they can provide everything your book needs are better at some tasks than others. You don’t want to find out that their weakness is editing. Step Four: Find out if this person edits books in your genre/uses your style manual. For example, as a history writer, I wanted someone with experience editing similar books and who could make sure my book conformed to the Chicago Manual of Style. An editor who worked exclusively on mystery novels might be talented, but not a good fit for my book. Step Five: Initiate e-mail contact with a few editors and ask for basic information. This will give you a chance to find out more about these people. You can ask about pricing, if they’re taking new clients, when they might be free to work on the book, etc. See if their writing style and personality fits with yours. Step Six: Study the editors’ responses for mistakes or other quirks. I got to this step with one editor and realized that she had misspelled my first name, which is in the dictionary. Needless to say, I didn’t hire her. Step Seven: Ask the editors who are still on your list to copy edit a few pages of your book. Before any freelance editors who are reading this get angry with me, I’m not saying that an editor can’t charge a fee for a sample of their work. However, self-published authors need to see how the right editor can transform their manuscripts. When I received my sample manuscript pages from the editor I later chose, I was amazed at how much he had improved my work. For example, after adding material to the first chapter, I forgot to include one historical figure’s title–secretary of war–the first time his name appeared. Fortunately, my editor saw my mistake, along with others. Step Eight: Hire the editor who amazes you! My question: I’m told that my blogsite on (mostly) U.S. history should have an incentive for people to sign up and therefore learn more about my self-published book on the U.S. and the Holocaust. In your opinion, what’s a good freebie for a history blog? Catherine’s answer: This wouldn’t be my area of expertise, Heather, but I think the simple answer is a preview of your book. Try to make it something that stands alone–like a chapter about a single topic–so they don’t HAVE to buy your book to appreciate it. Just a simple PDF will do. Make sure to put links in the end of it so if they want to buy your book, they can! My book cover design is here! I can’t use the word “finally” since my designer Jane Dixon-Smith works pretty quickly, but when you’ve been writing and researching for what seems like ages, seeing your final cover is a great feeling. I didn’t know exactly how my cover would look, but I was looking for a few specific things in a designer. Someone who was experienced and recommended by at least one other self-published author that I liked. A price that was lower than what most women state is their budget for a wedding dress on Say Yes to the Dress. If you haven’t looked for a cover designer yet, please just trust that I’m not exaggerating. A choice of covers, but not a ton of choices since I’m indecisive. Jane gave me three great options and I had trouble picking one! After deciding on a designer, I felt my cover also needed certain qualities. A design that made the subject of my book on America and the Holocaust clear, even on the small image that would pop up on Amazon. Despite Jane’s request for examples of 6-10 covers, I could only find one book cover on a similar topic that I really liked. Instead, I put together some images in a Word document that I found on Pinterest and asked Jane if she could include the American flag in her design. No photos, since I needed to also hire an editor, have money to feed my dog, etc. Something that didn’t look like I designed it, since I have no artistic skills other than writing. After seeing samples of Jane’s work, I wasn’t worried about this. The designer and the design I chose met all of my requirements. The combination of the American flag and the Jewish star helps set the tone for my book on a small U.S. government agency whose members tried to save Jews during the Holocaust. If you’ve self-published a book or are considering the idea, what are you looking for in a designer/book cover? Picture it: Chicago, December 2001. I was looking for a topic for my honors thesis. I knew I wanted to work with my history advisor, who was a Holocaust historian. Since I spent most of my time studying U.S. history, I decided to dig for information on America and the Holocaust. My advisor told me that America and the Holocaust was too broad for my thesis. He also suggested that I look for a topic that hadn’t received much attention. I asked if I could write about Eleanor Roosevelt’s response to the Holocaust. He said yes, if I found enough information on it. A couple of hours at the library told me that my new idea was too narrow. While sifting through books on U.S. and the Holocaust, I discovered a chapter here and there in several books about a government agency created in 1944 called the War Refugee Board. At first I thought, a thesis about a government agency? BORING. Once I started reading about the people behind the agency, though, things got interesting. These men were not household names (anyone familiar with John Pehle, and if so, how to pronounce his name? ), but they were working their tails off trying to save the few Jews who hadn’t been murdered yet in the Holocaust. I started to ask myself questions like why wasn’t the War Refugee Board created sooner? What drove these men, who were mostly from Protestant backgrounds, to risk their jobs by going to the president and criticizing the administration’s lack of response to the Holocaust? So I wrote my thesis, and put it on my bookshelf. I always thought the topic would make a great book and that a well-known historian would write it. Fast forward several years, and no one else had written a book about the WRB. I contacted my former professor, who encouraged me to do more research on my old topic. Ironically, shortly after I wrote my thesis, a major project to collect the papers of the War Refugee Board was completed. I discovered that I could borrow microfilm from the Library of Congress and read the actual memos that FDR and Board representatives wrote. 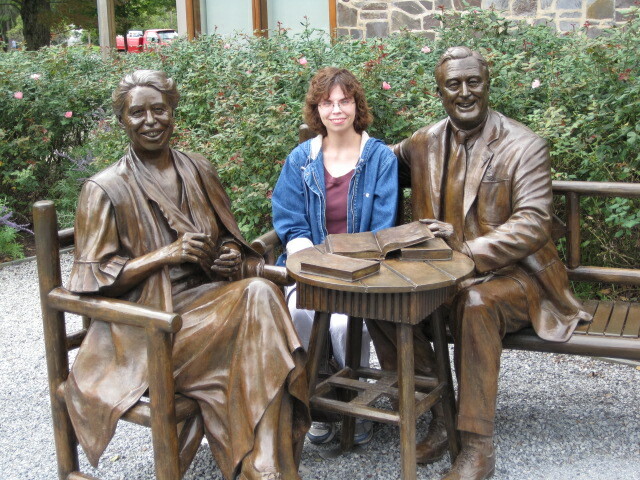 I spent at least a year of my life looking through those documents, and then I visited the FDR library in Hyde Park because I couldn’t borrow everything I needed. (The picture on the top of my blog and in this post is of me outside the library. I was one relieved researcher)! My book wasn’t going to rehash my thesis, however. After studying the memos and other government documents related to the Board, I made an interesting discovery. Not only did the members of the War Refugee Board save Jews, but they also made an impact on American foreign policy that continues today. As I mentioned in a previous post, I hoped for a publishing contract, but decided to self-publish when that didn’t happen. Hopefully self-publishing will make my work available to the largest possible number of people, since that always was my main goal. After sending my manuscript to both academic and small presses, I have decided to self-publish my book on America and the Holocaust. (Specifically, it’s about the War Refugee Board—a government agency created by President Franklin Roosevelt whose members tried to save Jews who were still alive in Europe in 1944). While all of these publishers said “no,” they did not say, “this book is badly written” or “the topic is boring.” Instead, I got objections that I believe I can overcome with self-publishing. I listed a handful of them below. Objection One: This is not a good fit for our list. 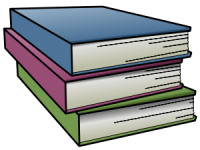 As a self-publisher, the only list I have is for books written by me. Some editors were nice enough to recommend other places where I might send my manuscript, though those presses had other objections. Objection Two: Investing in a new author is risky. As my uncle would say, a bus could hit any one of us tomorrow. His point? Life is inherently risky. I’ve read that self-publishing is risky, too, but I decided to defer to my uncle. Objection Three: The book is too short. My book and I prefer to be called vertically challenged…I’m kidding. Still, if I self-publish, length doesn’t matter. Having a shorter book will probably make the process a bit more affordable. As someone who also reads books, I appreciate writers who use as much space as they need to tell their stories–no more, no less. Objection Four: People who do not have PhDs in History could understand this book. I know some really wonderful people with PhDs, but I don’t want to limit my book’s audience to people who a. have PhDs in History and b. are interested in the Holocaust and/or President Roosevelt’s administration. Since most people don’t know much about what the members of the War Refugee Board accomplished, I want as many people as possible to understand it. So, that tells you why I’m self-publishing my book. How I’m going to self-publish is still a work in progress. I’ll have more on that topic later on, as well as more general history posts. If you’ve self-published or are working on a self-published project, what made you decide to do it?